As part of France’s international commitments, the Environment Ministry has outlined action plans to preserve biodiversity. The general aim of the schemes is to improve understanding in order to better preserve endangered flora and fauna species. Recovery plans are a continuation of this initiative, implemented for species of conservation concern. The choice of species is determined by the following criteria: endangered status nationally and across Europe and France’s heritage responsibilities. 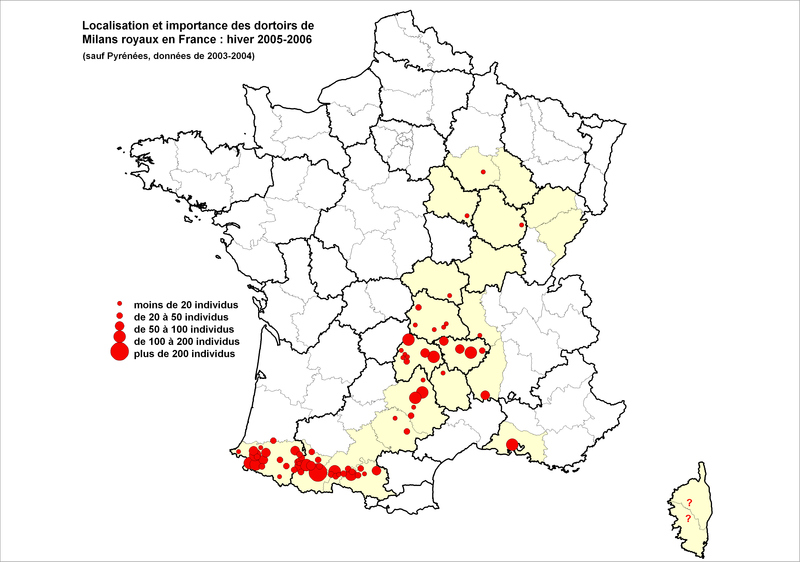 With declining red kite populations in France and also in the rest of Europe, 1999 saw the LPO launch a strident call for action as a result of the species’ critical situation. A working group was immediately formed under the authority of the Environment Ministry, with the ministry going on to develop a national action plan and begin a study into the species’ status in Europe. Drafted by the LPO and approved by the National Council for Wildlife Protection in 2002, the general aim of the five-year action plan (lasting from 2003 to 2007) was to stop the decline in French red kite populations and encourage the recovery of the species. This aim was expressed in five specified targets and eleven points. To find out more, click here (page two of information pack). Completed in 2007, the plan was studied and assessed. 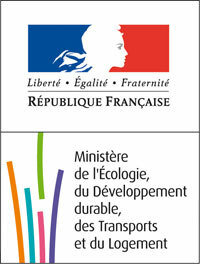 In light of the conclusions, the Environment Ministry agreed to implement a second plan, with a draft due in 2010-2011. During the transition period, the points of the first plan will be followed. Every year, paid and volunteer ornithologists monitor pairs of nesting red kites in their area and follow breeding developments. The results of the breeding (success or failure and number of offspring living to flying age) are a key factor in measuring the population’s condition. Increases in birth rate reflect a more active population. Certain areas are monitored more closely, following a precise list of criteria that can be downloaded here. If you are a keen bird-watcher and are prepared to commit to several years of following red kites in your area, contact Aymeric Mionnet (aymeric.mionnet@lpo.fr). France is home to over 5000 wintering red kites, with more of the birds wintering there than in any other country except Spain. Red kites can be counted when grouping together to sleep, which provides a reasonably comprehensive picture of the species when wintering. Roosts are counted between 15th December and 15th January, which is the best period to study a proper wintering roost as outside these dates, the birds can still be migrating and may be stopping only temporarily. Since 2007, following annual wetland bird monitoring (Wetlands International), a simultaneous count of wintering roosts has taken place at the start of January each year. This is achieved thanks to the involvement of a very large number of volunteers (over 150 data collectors from some twenty naturalist groups). These studies provide an initial but nevertheless precise view of the distribution of wintering red kites and a relatively exact estimation of the entire national population. Join the network of data collectors or submit your wintering bird information by contacting Romain Riols: romain.riols@lpo.fr. Since 2007, our Swiss counterparts have also participated in counts. France enthusiastically encourages the other European countries that are home to wintering red kites to take part in these counts. Wintering birds census through wing-marking programmes also leads to a better understanding of where wintering birds come from as well as the behaviour and movements of red kites over winter. 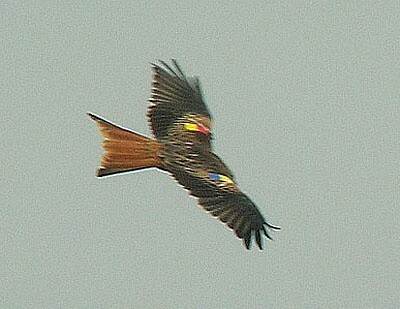 Excluding the population in the Iberian Peninsula and the few sedentary red kites in Northern Europe and those further east, France occupies a special position for tracking continental red kite migration as almost the entire global red kite population crosses the country to reach wintering areas in France and, most commonly, Spain. A significant proportion of red kites do not cross the Pyrenees, wintering north of the mountains. In addition, the total number of both birds that winter in France and those that cross the Pyrenees should enable us to calculate exactly the size of the European non-Iberian red kite population, provided figures for wintering red kites elsewhere in Europe are acknowledged. Tracking migration across the Pyrenees becomes extremely important, then, in providing an insight into how these populations are faring. 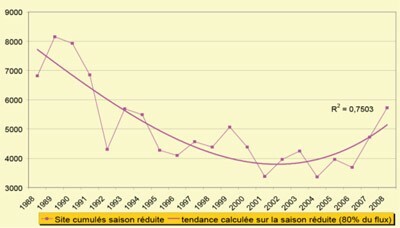 Since 1991, however, Organbidexka Col Libre (OCL), an association that monitors migrating birds as they travel through mountain passes in the Pays Basque region, has noted alarming decreases in red kite populations. The trend continued for a number of years, with only 5,067 birds counted in 2002. From 2002, annual tracking of post-pairing migration still shows a worrying decline in populations at a rate of more than 2 % each year (a total of 56 % over twenty-five years). Ringing and marking are scientific practices that are placed under the authority of the National Museum of Natural History in Paris (Bird Population Biology Research Centre, CRBPO). They are necessary in order to reach an understanding of populations’ activities. 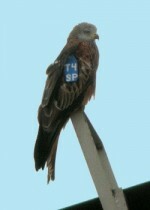 Wing marking is often used on soaring birds of prey. 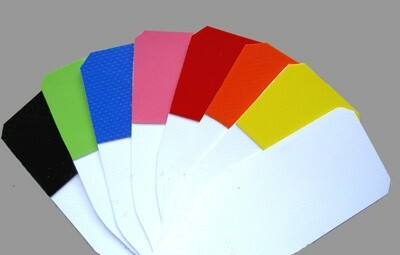 Attaching plastic tags to a bird’s wings allows individual birds to be identified from several hundred metres away. In France, a red kite wing-marking programme began in 2005, aiming, in part, to ensure an understanding of the activity of red kite populations and their survival rates. It should also provide information on the location of wintering areas, philopatry, territory identification and size, loyalty to partners and family links. A tag showing two colours (from a total seven) is fixed to each wing of the bird (only ever offspring from that year). These are read from top to bottom and from left wing to right wing. Other wing-marking programmes are underway in other European countries. As a result, red kites with other marking combinations can be seen. For more information on marking programmes, click here (page seven of information pack). If you see a marked bird, you can note your observation on the downloadable form (PDF ou Excel) and send it to the programme's coordinator, Aymeric Mionnet. The ‘feeding stations’ scheme marks a continuation of the carrion feeding stations established as part of the Grand-Causses programme to reintroduce griffon and cinereous vultures to the area. The carrion feeding stations supported the reintroduction of the two vulture species by providing food near to where the birds were released. Less restrictive special feeding areas are set to replace carrion feeding areas while enabling food that is legally unattainable to be made available. Today, regulations recognise the positive role of scavenging birds of prey in helping to break down carcasses. As a result, creating special feeding areas would be a means of ensuring red kite conservation, a tool with which to compensate for declining prey populations and the closure of landfill sites. They also allow healthy food to be provided (reducing the risk of poisoning which notably takes place during bromadiolone treatments) and are, therefore a significant measure in helping to curb the worrying decline in the species. However, they should still not replace indispensable comprehensive work to restore natural environments and improve agricultural practices. To find out more about special feeding areas, click here (pages 9 and 9b of information pack). There are currently eight feeding stations in which food is provided for red kites in winter. In order to identify and rank causes of red kite deaths, every dead red kite cadaver is taken for an autopsy (under the supervision of the CNITV [National Centre for Veterinary Toxicology Information]) and toxicology testing (at a specialist laboratory). This poison monitoring, or ‘vigilance poison’, relies on a network of bird-watchers and a specialist committee of vets, toxicologists and ornithologists. If you discover a red kite cadaver (or any dead scavenging bird of prey), please alert LPO Mission Rapaces (rapaces@lpo.fr) or a local association as soon as possible. If you can, please fill in the downloadable form here (page 11 of information pack). Natura 2000 Network: with IBAs and SCIs having been updated, SPAs were identified as benefiting red kites. Today, between 11 and 20 % of nesting populations are found in SPAs. However, this statistic remains far too low given France’s role in protecting the species in Europe and the species’ condition nationally and across the continent. Agri-environmental measures: in 2005, sustainable agriculture contracts (SACs) benefiting red kites were created in certain SPAs, while agri-environmental measures (AEMs) were trialled in Bassigny (in the Haute-Marne department) at the end of 2007. While the tools available are not entirely suited to the species, it is still useful to establish measures that aim to preserve nesting sites (hedge maintenance, isolated trees, etc.) and beneficial hunting areas (extensive pasture, preserving natural meadows, limiting chemical treatments, etc.). Monitoring the red kite population in Corsica: while red kites are experiencing a decline in metropolitan France, the species’ condition is entirely different in Corsica. The red kite population there is sedentary, remaining on the island, and its positive status is linked to a combination of factors including concern for the species’ preservation, large open spaces being maintained and rabbits, which were introduced to the island in 1950, thriving. Taking the atypical nature of the situation into account, the condition of the population needs to be analysed. Reintroduction: a reintroduction programme began in Tuscany in 2007, with special assistance from Corsica. Several young kites were taken from the island and released in Tuscany. The project aims to re-establish a stable red kite population in central Italy. Red kites are endemic to Europe – in other words, they are exclusively found in Europe. However, the bird is now among the continent’s near-threatened species. Our counterparts in the Czech Republic, England, Switzerland, and elsewhere are also acting to ensure its preservation as a result. The effective protection of the European population requires close collaboration between different countries. A European action plan has recently been drafted at the behest of the European Commission. It should be in place in 2010, and will last for ten years.